The film shows kids how they can take an active role in limiting climate change by using the Three R’s (reducing, reusing, recycling), composting, planting a tree and even raising funds by hosting a climate change bake sale. For educational use, the DVD also offers a downloadable eHandbook, vocabulary flash cards, educational games and more. Climate change might not exactly be a hot conversation topic for your average 4 to 14 year old. 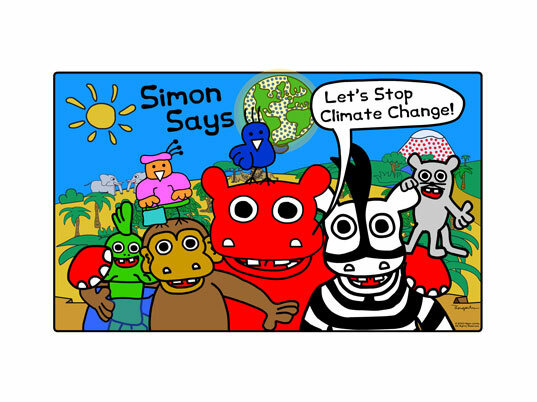 But the new Hippo Works DVD Simon Says "Let's Stop Climate Change" brings this serious topic down to a level that kids can relate to. Creator and cartoonist, Denis Thomopoulos employs the Hippo Works cast of animated characters, including Simon the red hippo to teach kids about the causes and effects of climate change using silly stories and catchy songs like "One by One, Ton by Ton" and "The Power of Poop!"